With a brand new LS 410 engine, a rugged duplex split cradle frame designed and developed by Harris Performance and a strong monoshock rear suspension, Royal Enfield’s Himalayan balances aspiration with access, and is a serious contender in the adventure riding stakes. 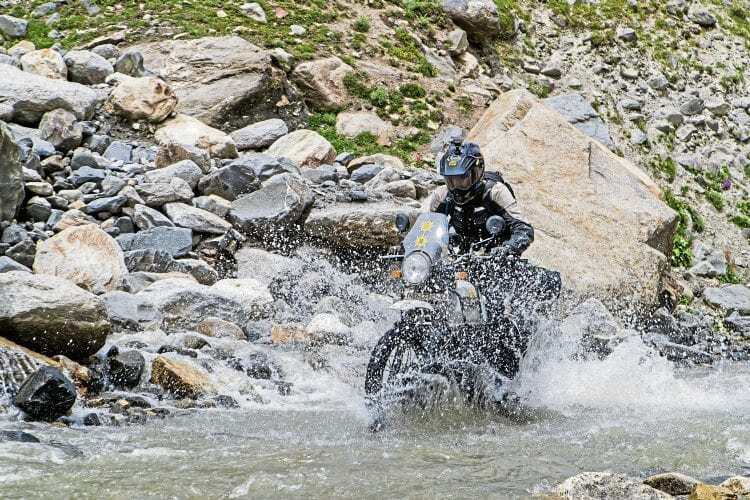 Fast-flowing mountain streams hold no fears for Royal Enfield’s sturdy new contender. Bringing together 60 years of Himalayan riding experiences, Royal Enfield’s first-ever adventure motorcycle sends yet another signal to potential customers and the motorcycle industry at large about just what the burgeoning Indian manufacturer is capable of, and where it intends to go. While, compared to many of today’s perhaps unnecessarily sophisticated adventure machines, the Himalayan might appear rather spartan, its flat torque curve, accessible seat height, long suspension travel and ease of ownership are everything that both the seasoned rider and adventure riding novice could wish for. Rocky river beds and stream crossings hold no fears for the agile newcomer, whose optimal wheel size combination and long rear suspension travel help produce a ground clearance of 220mm, and the brand new 411cc overhead-camshaft engine, producing 24.5bhp and designed for high torque and usable power at low rpm, is the perfect choice for this machine. Adventure bikes are meant to be just as happy on smooth Tarmac as on the rough, and with its low-maintenance engine allowing around 6200 miles between oil changes, and its 15-litre fuel tank giving a range of over 250 miles, the Himalayan is just as happy in a busy urban environment as on remote mountain trails.